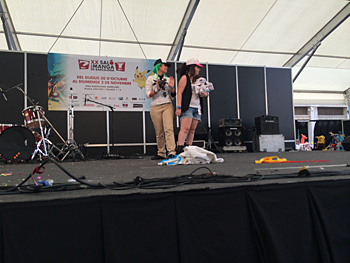 Finally, we have successfully presented Pokémon GO to the public. People’s support, among others, gives me power. There is nothing more encouraging for me as a person engaged in making things for people. I am happy. I sincerely appreciate support from you all! While I am participating in the development of Pokémon GO for the construction of its world view and for its game design and music, we are trying to make it enjoyable as a location-based game by removing and dismantling the world view of Pokémon as well as common knowledge in game design, and rebuilding them into a new design. There is still a long way to go in its development, but I’ll go on making the best things with Niantic so that people around the globe can enjoy them. 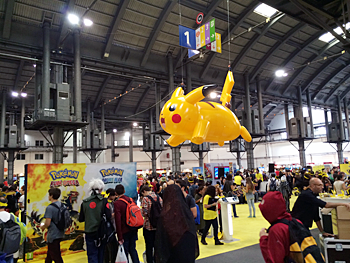 We hope to exert continued efforts to make products enjoyable for all, including Pokémon fans and Ingress fans across the world, and even for those with no experience of playing with Pokémon. 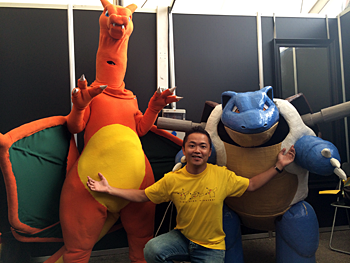 Toward the 20th anniversary of Pokémon, we express our hearty thanks to all. 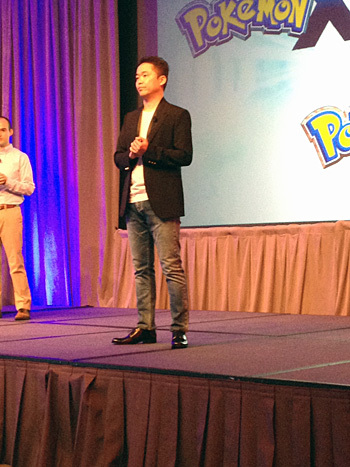 Pokémon GO is scheduled to be released for smartphones (on iOS/Android) in 2016. 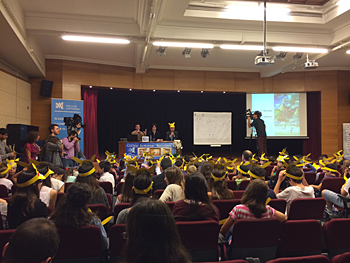 October 31, it was the chestnut festival day in Spain! El Col-legi Lestonnac de Barcelona for a lecture. 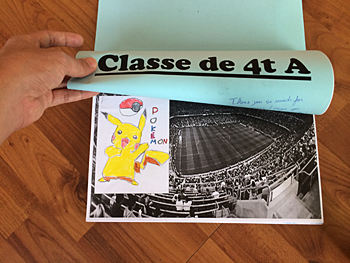 we should do if the pupils knew nothing about Pokémon. and they welcomed us cheerfully with big smiles! We answered their questions as best we could. They were listening to us excitedly with twinkling eyes. We were so impressed and felt happy! Headmaster and teachers also were very kind to us. They served traditional Catalan sweets. Children laughed, clapped their hands and became serious occasionally. We appreciate their reactions very much. The more I talked, the more I was filled with emotion. I thought that it was really good to continue manufacturing goods. I got a lot of applause. I was so pleased that I almost cried. Moreover, I was handed a wonderful gift by two representing pupils. 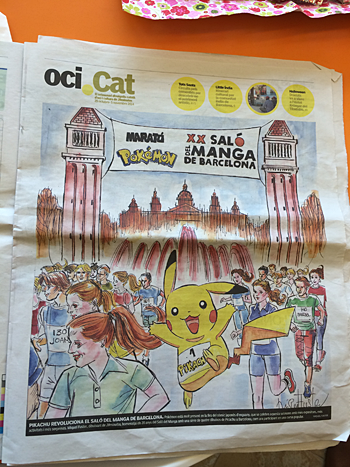 in Classes A, B and C.
The subject was “Pokémon in Barcelona”. It thrilled me further! Truly, they were very good at drawing. The gift contained about 60 pages and they were all lovely pictures. the children for giving us a wonderful opportunity! We surely got a lot of power from this event. 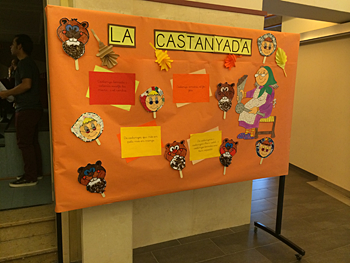 El Col-legi Lestonnac de Barcelona was an excellent school. This is the newspaper that reported on our visit to the school. starts about 42:55 on the image counter. gathering information and participating in events. all the media including newspapers, TV stations and radio stations. We surely bought the papers that reported on us, of course (laugh). 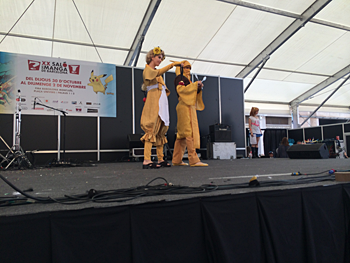 in this  kind of event in Japan. 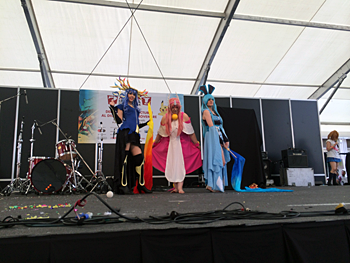 As expected, Salon del Manga also held these events. 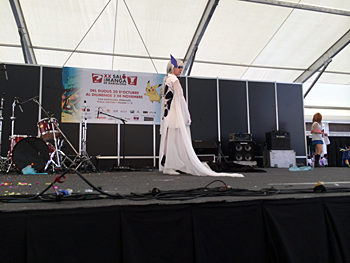 she performed one-man play to warm up the event! These three are the team winner! They expressed the beautiful view of the world! These two got the special award! and newspaper. It is exceptionally amazing! This is the winner of the battle tournament! 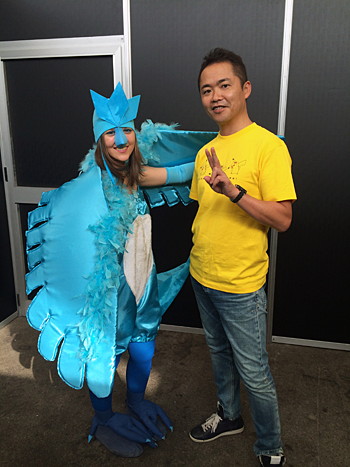 in Pokémon World Championships(WCS)  2014. It was no wonder even Omori could not beat him. Last of all, thank you very much for everyone who gathered at the site! I considered I should keep trying hard without just feelingthankful. I met in Spain for your hospitality! 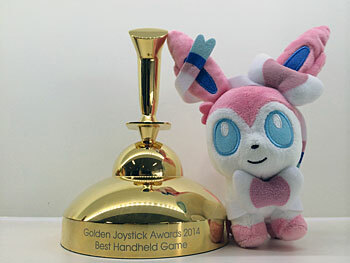 the Best Sales Award, and the Global Award at the Japan Game Awards. 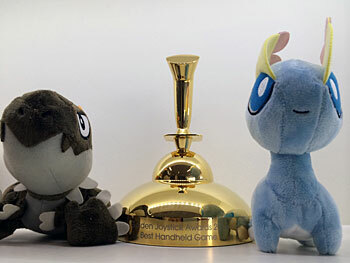 This time we’ve got awards in England, too! 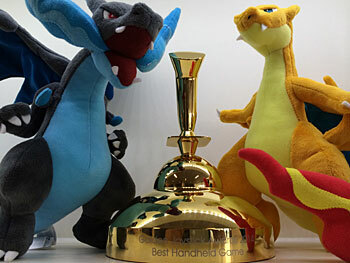 the Greatest Handheld Game Awards! and chosen by users’ votes. and we really appreciate your support. We are profoundly grateful for you. that we’ve been awarded such honorific awards! Those awards could not be realized without your hard work! Saturday, October 12th 2013 was the day that my dream came true. all across the world at the same time. 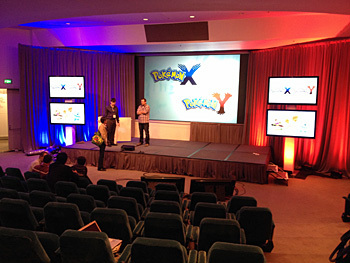 Launch events were held in France, New York, Germany, and Japan. The whole world celebrated the day. sharing the discovery and adventure together. I could bring that experience to each and every one of you! This time, the themes of the game are ‘beauty’, ‘bonds’, and ‘evolution’. raise their Pokémon with love. ‘Let’s create a better world together’. circumstances we find ourselves in. If your tastes were different, you may have met different people. depends on the chance encounters that they make. Encountering people is both coincidental and miraculous. We encountered each other in the same era, on the same planet. but about making a better world together. The titles ‘X’ and ‘Y’ come from this idea. The letters ‘X’ and ‘Y’ suggest lines on an axis. but there’s a point at which they cross, or intersect. the idea of the common points we share with one another, rather than our differences. I developed this game to communicate this idea. It took three and a half years to develop this game. 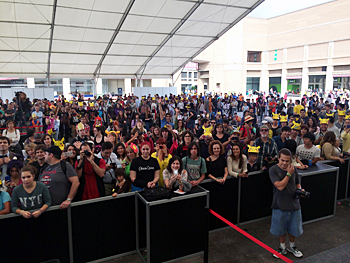 more than five hundred people were involved in the development. and I appreciate the miracle of the encounters that I had with them! Please enjoy the game from many different directions! I appeared in “Ikimono-gakari” promotion video clip titled “Egao” ,(“Smile”). *Ikimono-gakari is a famous Japanese band. where I met Yoshiki Mizuno – writer and composer the song. as it opens up new possibilities and experiences. Early morning in Roppongi, on 9th of June 2013.
so I asked to have a recording as a first person. I was sitting in the middle. Recording started. but director said it was good. All happened in a split second. I had fun doing the recording. Here is full video clip. 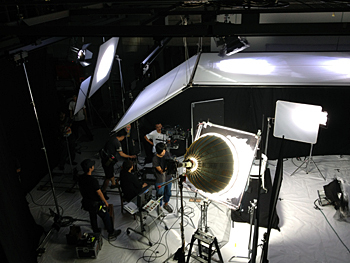 *This video clip may be available in Japan only. It was a great experience ! 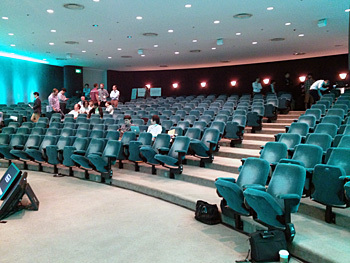 which took place in Los Angeles from the 11th of June. “Developer Round Table” for a presentation and Q&A. and we had a chance to discuss it. This year was different. I usually do not have much for the press during E3. I arrived in Los Angeles on the 9th of June. There is a 16 hour time gap between Japan and L.A.
After the 10 hour long flight, rehearsal started immediately. The day after that we had another rehearsal. And finally, the day came. Here is a photo from the first day of rehearsal. would be full of people. There were a lot of press members gathered in the hall. It was full of people. and a 40 minute long presentation. And then the time for Q&A had come. From that point photography and recording were permitted. 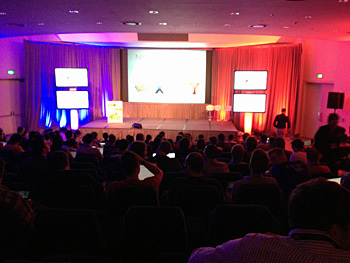 About 200 companies and about 300 people came to see the presentation. I really appreciated everyone’s participation. Takashi Tezuka, and Eiji Aonuma of Nintendo, and Masahiro Sakurai from “Sora”. And this is how the E3 “developer Round Table” went for us. Here’s a video clip from the presentation. It’s about 5 minutes long. And here is the information from Nintendo Direct. from Japanese to many other languages. we managed to achieve our dream. To launch the game simultaneously worldwide. it takes the creative co-operation of many, many people to achieve it. English, French, Italian, Spanish, and Korean. It’s very demanding work, but I believe all those involved did a great job. 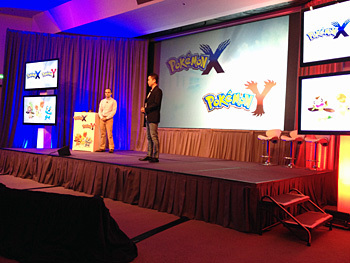 Pokémon X/Y will be launched at the same time everywhere. It will be on the shelves in stores all across the world on the same day. Checking on the web and still can’t find out what is it. It will be an incredibly exciting day. I hope all the players across the world feel that excitement too. Finally it will come true. It is a big achievement. 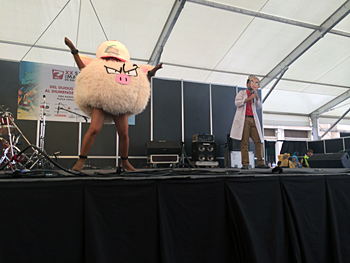 Pokémon will evolve into the next stage. I experienced that unusual place for the first time! I was nervous all the morning, before going there. 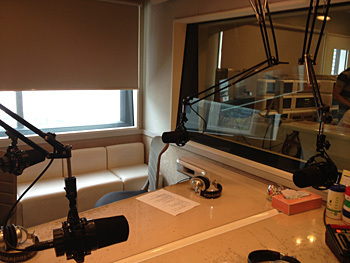 It was a radio recording studio, I visited! 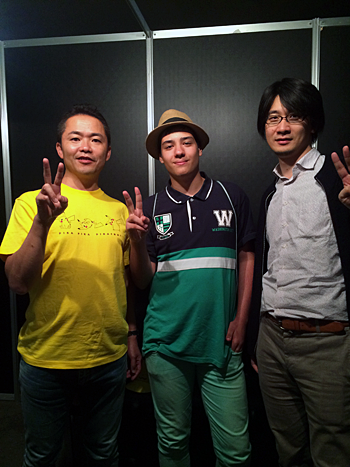 All members: Yoshiki Mizuno, Kiyoe Yoshioka, Hotaka Yamashita. *They are very famous in Japan. I was already totally nervous. The recording started and our chat went very well. Everyone was very kind, so I wasn’t so nervous anymore. Time passed really quickly in a nice atmosphere, and we finished. We talked about music and Pokémon related themes. If You wanna know more, please check it out. I want to thank to all band members for a great time. The episode I was invited to. Have you had a chance to play “Pokémon Dream Radar”? with a drawing by game director Takao Unno! 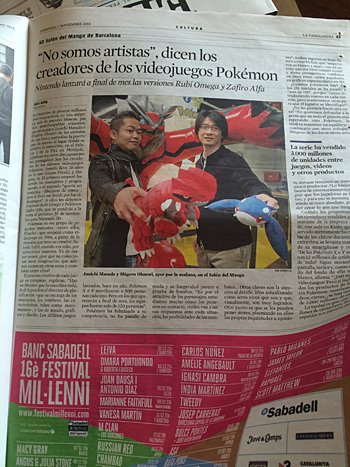 ※ Catch the legendary Pokemon using 3DS AR function!? ※ Use AR (expanded reality) function with camera. ※ Find “Dream Orbs” surrounding you, and collect them. ※ legendary Pokémon will appear on AR monitor. ※When legendary Pokémon will show up, catch him ! but by using Gyro function of 3DS, and repeatedly pressing a button. Takao drew the illustration to help understand the concept. The idea is very different to the one in original, RPG style Pokémon games. The priority was, to make player feel good, having dynamic controls. Like playing tennis, for example. The most important thing is to use the racket skillfully. To improve your own skill, you can challenge progressively more skillful opponents. The type and length of play will depend on who your opponent is. and make a game with no delays. We also need to produce the game’s visuals in a smooth and timely fashion, too. What’s the best way to develop a game? 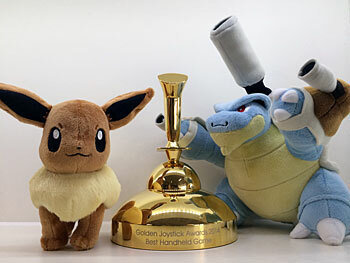 to produce the game “Pokémon Dream Radar”!!! please give it a go! we have been releasing information in Japan first. But this time everything changes. 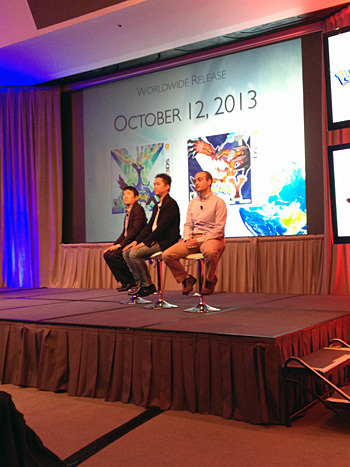 Pokémon X/Y will be launched at a same time, worldwide! legendary Pokémon names will be same worldwide. not available on the Japanese official homepage. 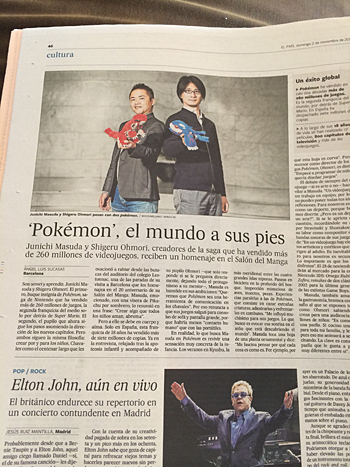 while fans from abroad are getting news faster, than fans in Japan. 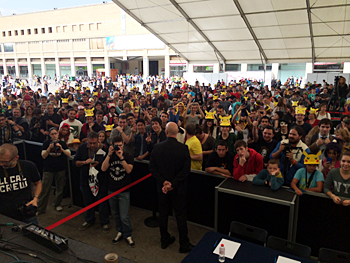 became a special event for our fans from abroad. You are the very first in the world!! !